2 quartos, acomoda 6, 2 casas de banho. A casa 'Vivenda (A)' '', ambiente descontraído ..
2 Quartos, Acomoda 6, 2 banheiros. Esta casa Vivenda A, tem dois níveis. O piso principal é composto por 2 quartos com (do casal) cama de casal, 2 casas de banho totalmente equipadas, no nível superior, duas camas de solteiro. A cozinha e sala de estar totalmente equipada, com lareira. Na opção piso superior de duas camas de solteiro. No exterior, uma vista fantástica sobre as colinas próximas, virado a sul do oceano e pontos turísticos de Ponta Delgada, a oeste. Casas de banho: 2 - (WC, chuveiro, bidé) Toalhas estão incluídas para a casa. Toalhas de praia não estão incluídos. I (Dave) stayed for 3 weeks to escape the Canadian winter and to get some biking and hiking exercise. My wife, sister and 2 daughters joined me for the last week to tour. The ladies rated the house and extensive grounds excellent, particularly the log fireplace in the living room. The rural location, set in the volcanic hills near the village of Cabouco was very beautiful and I did a lot of interesting bicycling on quiet well surfaced roads. The January weather was great for outdoor activity, daytime highs about 17 to 19 C, overnight about 14 C, very little rain, overnight, and plenty of sun. We had only very minor problems, and the owners, Armando and Mary were only a phone call away, were very helpful and themselves called on neigbours to assist us. We would love to return. Sehr schönes Ferienhaus in wirklicher Traumlage !! Sehr großer Garten für uns alleine. Ausflüge von hier auf die Insel sind in alle richtungen in ca. 30-40 Min. erreichbar. Wir können dieses Haus weiterempfehlen. Wir hatten vorher die Bilder gesehen und das sah alles gut aus. Üblicherweise stellt man dann vor Ort fest, dass Bilder zu viel versprechen. Das war diesmal nicht der Fall. Ganz im Gegenteil ist es vor Ort noch viel schöner als auf den Bildern. Auf der Terrasse sitzen, den Garten und dahinter das Meer, einfach schön. Der Vermieter war auch vor Ort, und hat sich sehr um uns gekümmert. So half er uns sofort, als die Fluggesellschaft den Flug mal eben um 2 Tage nach vorne verlegte. Auch später, er war zu der Zeit zurück in seinem Heim in Kanada, hat er sich mehrmals gemeldet, und uns bei Problemen mit dem Tor sofort geholfen. Wenn wir wieder mal auf die Azoren fliegen, wird das Haus unsere erste Wahl sein. Ach ja, man sollte unbedingt ein Auto haben. Andere Verkehrsmittel haben wir nicht gesehen. Sehr herzlicher und netter Empfang von Carmen und ihrer Familie, sehr gepflegtes Anwesen, sauber, sicher und absolut ruhig gelegen. Küchenausstattung ist komplett vorhanden, Dusche und Bad gut, Wohnzimmer mit Kamin sehr gemütlich. Die Aussicht von der Terrasse bis Ponta Delgada ist grandios, wir genossen den Abend mit einem Glas Wein und den Blick auf die Landschaft. Für den in der Nähe gelegenen Landwirtschaftsbetrieb (Milchkühe) sollte man Verständnis mitbringen, auch wenn bei ungünstigem Wind der 'Duft' des Betriebes auf das Anwesen weht. Dafür kann aber der Vermieter absolut nichts, wir konnten damit leben. Jederzeit gern wieder. Vielen Dank für die nette Kommunikation und Betreuung vor Ort ! My husband and I planned to stay a week at Vivenda A the second week of June. Armando was very helpful at answering all my questions before we arrived and arranged for his housekeepers to pick us up at the airport and show us around on our way to the property. The grounds and views are spectacular. The house is roomy and clean. Unfortunately it was unusually hot and humid and the house was ver damp. The beds are small so my husband and I slept in separate rooms. We had to open the inside windows( there are shutters and metal grates on the outside, that we were told not to open) to get some air in the rooms. There were many dogs in the area that barked all night. I had to put music on to drown out the barking. There is also a cow pasture next door and although it is very pastoral to look it,it can send smells into the house if the wind is blowing uphill. We left two day early because there were large brown cockroaches in the kitchen and bedroom. I am aware that these are common in hot and humid areas ( my son has them sometimes in NC) but this wasn’t one or two flying in. The screens were closed at all times and we killed 4 on the kitchen counter, 1 in the sink, 3 on the floor and a couple in the bedrooms. When I am on vacation I don’t want to be spraying for bugs. I read all the other reviews before I booked this property and no one mentioned the things I did, so I don’t know if this was unusual but I do believe it needs to be mentioned. Armando was very concerned about us leaving early and wanted to rectify the situation but I just wanted to get home to my own bed. kate elison, your comments are a big surprise for us.This is a COMPLETELY DIVERGENT COMMENTARY from all what we have had so far. Especially this year, as you mentioned, yes it is a unusually hot and humid summer, you mentioned to me, that you had " A BAD TIME' in Portugal the main land before you traveled to our Island S. Miguel, remember? " that it was always raining there and humid... BUT, in our house WE DO HAVE, 'IF IT IS NECESSARY" DEHUMIDIFIERS, and works very well... and you could used them. About the cockroaches, when is a hot and humid in the summer time, those insects appears more and..if we leave the doors open, surely you are inviting them in, BUT we do have nets in all the doors and windows for the fresh air to circulate inside and around the all rooms, you are the first couple that mentioned something like that, look at the review of the couple a few weeks before you, and they were at the same house that you were" for their honey moon. About the beds, it was just one couple, two years ago, the husband was almost 7 feet high and he said the bed was a bit smaller for him, but they give us a 5 stars review, not a two stars review as you did. Maybe, "you were a bit unlucky about this vacation, "first in the main land in Lisbon", and then in Azores. Anyway...thanks for the review, it makes us more attentive and to improve more on our property in "certain ways". We stayed two weeks at this property and enjoyed every second. Armando and Mary, although they were not present, kept in touch and gave us great advices on where to go to enjoy our stay. The property is spacious and well kept, the fireplace was a very nice touch for the colder April nights and you have everything you need in the house. I would definitely recommend this charming property and might very well be renting it again in the future. Dear David and Rebekah!!!. We always give our best for our guests to feel at home. Our guests are all special for me and Mary, and we consider all of our guests " "Friends for Life." Thank you for choosing our "little paradise" for your honeymoon. We feel happy that you enjoyed your stay at our vacation rental house. We hope to see you again in the future. Thank you for the nice compliments. 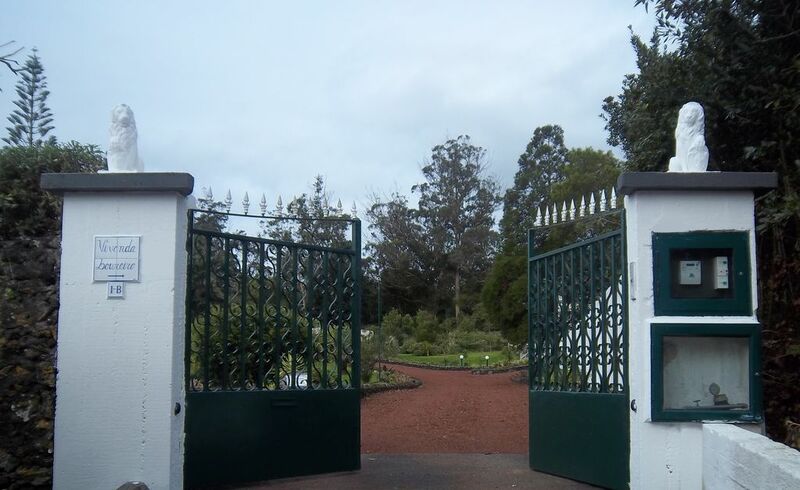 Our gardens are improving regularly, our goal is to provide a comfortable setting for our guests..... to create wonderful memories of your vacation in S.Miguel-Azores-Island. LOTS OF HAPPINESS for Your Future Together. da casa, na cidade de Lagoa tem um supermercado (Continente- Modelo), onde você vai encontrar tudo que você precisa. O porto de pesca da Lagoa 'Porto dos Carneiros' oferece diferentes opções de restaurantes especializados em frutos do mar frescos ou carne diariamente. Em aproximadamente 2 km das casas você vai encontrar as famosas piscinas Lagoa (águas do mar piscinas ou nadar no oceano). Uma unidade de 5 minutos a leste vai levá-lo até a montanha cratera off Lagoa do Fogo, fogo lago por algum fôlego com vista para as diferentes partes da ilha. Descendo para o outro lado da montanha, você virá para a Caldeira Velha, uma cachoeira e piscina quente escondido em um vale encantado de árvores de samambaia e fluxos de água fumegante. Se o golfe é a sua paixão, dois cursos fantásticos estão disponíveis, uma a leste e outra a oeste da propriedade; ambos estão dentro de uma unidade de trinta minutos. Este alojamento está convenientemente perto de todas as necessidades e ainda dentro do ambiente natural e pacífica. Após um dia de explorar esta bela e natural paradise (Ilha Verde), conhecida como a Ilha Verde, de São Miguel, você vai se sentir uma paz esmagadora no seu retiro privado.